OpenSpace is the energy of a good coffee break, with the flexible structure of wiki, where last minute, new creative ideas that otherwise wouldn't be on the WikiSym program to be worked on by all types of wiki enthusiasts, in a format that allows deeper consideration of an issue than can be achieved with a 20 minute presentation. 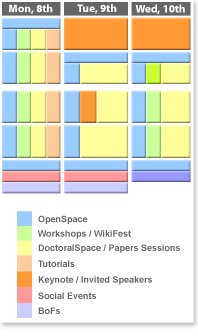 As a point of reference, many unconferences are organized with OpenSpace or a variant. This is an online version of the paper Session Report/ Relatorio de Sessao to use on the page for each session. Tracking Wiki Evolution - How can we measure and predict wiki growth patterns? What standards do we need to do so? How good is MS Sharepoint as a wiki? How to measure contributions in a corporate wiki? Wikis for kids: How good they can be?? How to sell a wiki both internally and as a consulant? What are the tasks of a wiki gardener? In 1985, Harrison Owen organized The Third Annual International Symposium on Organization Transformation in a very different way. Harrison claims people have been meeting this way as long as there have been people on earth, though many would say that the minimal structure Harrison added is essential, just the minimal structure provided by a wiki is essential. In a wiki, automatic linking is one of those pieces of structure, for example. In Open Space, the time grid on the wall is perhaps essential. 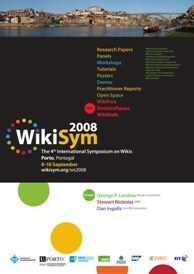 This page was last modified 22:16, 26 September 2008.